Though the kidneys regulate the blood's composition, there are certain hormones that aid in homeostasis in a capacity relative to the kidneys. One such hormone is antidiuretic hormone (ADH). ADH is released from hypothalmus when osmoreceptor cells in the hypothalmus detect a rise in blood osmolarity (which is normally 300 mosm/L), normally caused by an excessive loss of water. ADH reaches the kidneys by way of blood vessels. Once there, the hormone acts upon the distal convoluted tubules and collecting ducts by making them more premeable to water so that more is reabsorbed. In this way, water is conserved in the blood. Also, ADH makes an individual thirsty, so that the lack of water problem is alleviated. Another problem that is solved through manipulation of the kidneys is low blood pressure or low blood volume. To aid in this there is a specialized tissue called the juxtaglomerular apparatus (JGA). When blood pressure drops or if there is a lack of sodium in the blood, the JGA releases the enzyme renin into the bloodstream. Renin acts on the plasma protein angiotensin, and turns it into its active form, angiotensin II. Angiotensin II then constricts arterioles which raises blood pressure. Raising blood pressure in the afferent arterioles increases filtration. Angiotensis also acts on the adrenal glands, promoting the production of aldosterone. 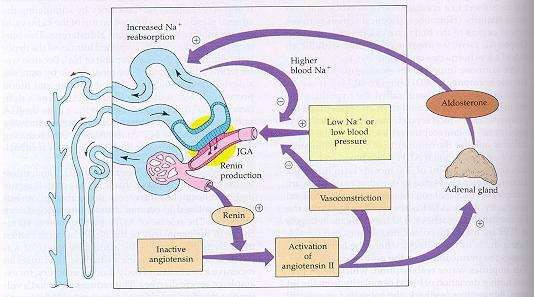 Aldosterone stimulates the reabsorption of sodium ions in the distal convoluted tubule. Water then naturally follows the sodium into the blood stream because of osmosis, and raises the blood pressure.